I’m Ahuva Heliosense. I’m Rising! I hold strong views on many subjects. I try not to preach to my friends and coworkers. But in this instance, I believe so strongly in this movement, that I am speaking out to you. Yes – YOU. I mean you – male and female both. Join the revolution. End the violence. To get you revving – watch the video. Yep, I’m there. Honour is there. Saffia is there, Pyper, Tatiana, sooooooo many others. There is still time for you to be there too, on Feb 14th. Schedules will be posted later this week. Pyper Dollinger, Tatiana Kurri, Saffia Widdershins, Petlove Petshop, Honour McMillan, and Aisling Sinclair have done a FANTASTIC job on this video! You have to LOVE The Dazzlers. I want to be a Dazzler when (if) I grow up! You need to get yourself over to Prim Perfect and pick up the poster and your t-shirt. They have both male and female mesh shirts, in a variety of sizes, both black and white backgrounds. Hey there! Yeah – YOU. I’m talking to YOU. Ya wanna be a star? Ya wanna make it in the Big Time? C’mon over heah. I got an “in”. I can help ya break into the ranks of the top dancers in SL. Really. And – at no cost. /me nods sincerely. 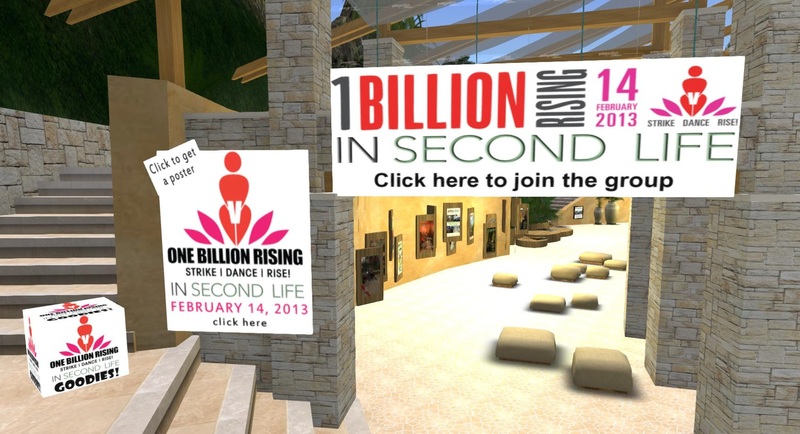 One Billion Rising is coming to SL. You can be part of it. The only requirement? Female avatar in appropriate attire. What’s One Billion Rising? 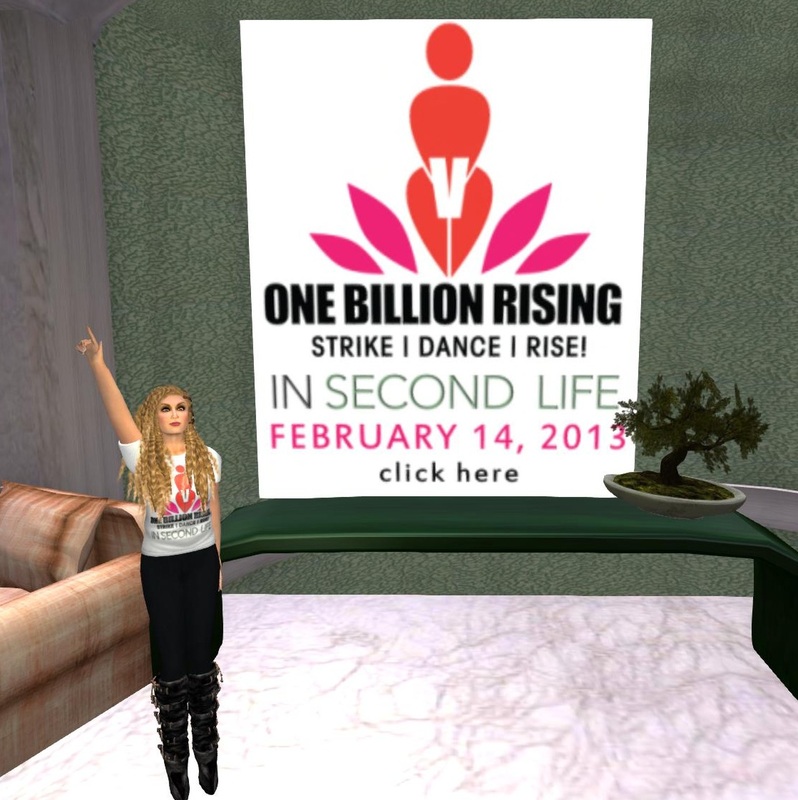 I’m glad you asked that…… Click the link and read about One Billion Rising in SL. Click and get the most fabulous ear-worm you could ever hope to have. One Billion Rising. Be one of a billion. February 14th, 2013. All around the world and inworld. 🙂 Break the Chain. There’s still time to be part of the pre-recorded videos: Drop a note card to Samantha Ohrberg inworld.